Very rare old Hollywood movie poster of the Steven Spielberg cult classic, E.T. (1982) for sale. 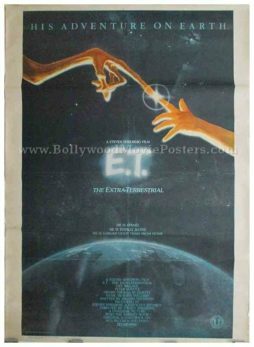 Featured here for sale is an actual surviving original movie poster of the Steven Spielberg masterpiece, E.T. E.T. was a blockbuster, surpassing Star Wars to become the highest-grossing film of all time – a record it held for ten years until Jurassic Park surpassed it in 1993. The film is widely regarded as the greatest science fiction film ever made in the history of cinema. E.T. holds coveted rankings in several must see film lists, making this old movie poster highly collectible. Printed in India during the original first release run of the film somewhere in the early 1980s, this poster was intended for publicity but never ended up being used. E.T. is a 1982 American sci-fi film co-produced and directed by Steven Spielberg. It tells the story of an extraterrestrial, dubbed “E.T.”, who is stranded on Earth. It is widely speculated that E.T. was inspired in parts from the 1967 script, “The Alien,” written by India’s finest filmmaker, Satyajit Ray.